Product #17859 | SKU DWTB01E42 | 0.0 (no ratings yet) Thanks for your rating! 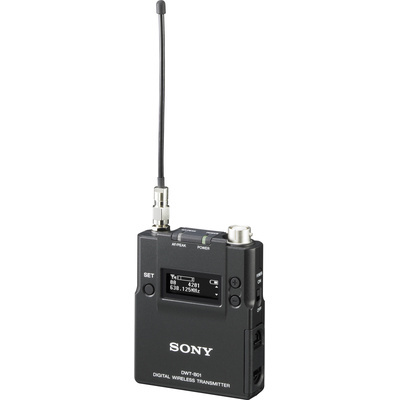 The DWTB01/E1424 Digital Bodypack Transmitter from Sony is designed to work with DWX series wireless systems. It accepts both mic and line level sources system and transmits between 470 to 542 MHz bandwidth. The unit's features, such as input attenuation, RF frequency selection, RF power output, and power sleep mode can be controlled via the wireless receiver. It is powered by 2 AA batteries and accepts alkaline, lithium, and nickel-metal hybrid battery types. The RF power output is adjustable between 1, 10, and 50 mW.